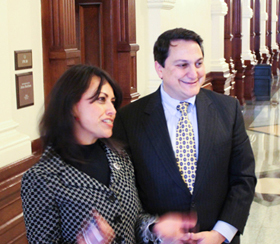 Chairman of the Republican Party of Texas Steve Munisteri says: "We need more serious outreach, the National Party has to make a Commitment"
During the first day of the Texas 83th Legislative session, I spoke at the Capitol with Steve Munisteri, Chairman of the Republican Party of Texas. He responded to the expectations and the future of the Republican Party as well as the Party's outreach plans. Chairman Munisteri reported their political staff, including David Zapata, has been working on a comprehensive outreach plan. These plans include hiring additional field staff to bring the Republican message to all communities in the state, data mining, and increased efforts to communicate with outside groups including auxiliaries to assist in outreach. As part of this effort, the RPT staff has worked very hard in December to set up an outreach conference scheduled for January 15th at which National Chairman Reince Priebus will have an opportunity to meet with various auxiliary groups and leaders and and listen to our proposals for outreach both here in Texas and nationally. Adryana Boyne: Hello we’re here with TexasGOPVote and VOCES Action with Chairman Steve Munisteri of the Republican party of Texas. It’s so nice to see you today. Steve, will you tell us a little bit about what your expectations are for this session not just right here in the Capitol, but also for the future of the Republican Party of Texas for the next couple of years? What are you foreseeing now that you are an elected chairman of the party as well as for statewide legislation? Steve Munisteri: Sure, we have some very good news this week, that our economic growth has been very strong and our revenues are up and what that shows to me is that the policies that the party passed last time, which were to keep our taxes per person as low as possible, our spending per person very, very low, try and have a good business environment, and support capitalism resulted in having a very, very strong economy and it allows us to have some money to put into roads and water and things of that nature. So that means that we should continue to make sure that we stay a low tax state, we stay a low spending state, that we keep the size and scope of the government under control, or in short, another way to say it is to just make sure the legislatures follow Republican principles…it works. So we’re going to be working on bills of the legislature that are consistent with the Republican Party platform. Adryana Boyne: What is the future of the Republican Party right now in Texas and in the following years? I do know that you have a deep interest especially also in Hispanic outreach, and I wanted to congratulate you for having David Zapata on the team at the Republican Party of Texas because he’s doing an awesome job, we work very well with him. Can you tell us a little more about what is coming up for the Republican Party? Steve Munisteri: Well my immediate goal is I’m trying to convince the Republican National Committee to invest in a more serious outreach, and to me, serious outreach is that they need to spend literally millions of dollars nationwide and perhaps hundreds of thousands here in our state to hire people who can be permanently out in the field in different communities. Until we do that, we’re really limited with what we can do by money, we’re doing what we can with having an outreach director, we’re doing polling, working with the auxillariies, but I think it’s really going to take the commitment from the national party to spend some money and they raise plenty of money to make sure that it’s not just the Hispanic community. We also need to be active in the African American community, the Asian community, and with young people. So that’s something that is coming up in the next week, we have meetings with the RNC. I’ll tell you that we’ve been doing some things recently, we’ve just paid for very expensive polling of the Hispanic community. We now have data that I don’t think anyone else has as to during this last election, what were the issues that were most concerned about with the Hispanic community, what percentage of the vote are different candidates getting, wha the view of the Hispanic community is of the Republican and Democratic parties. Are they conservative, are they liberal? Now I don’t want to release the results of the poll because we spent so much money and it would also help the Democrats by knowing this, but I’ll just say I thought it was very encouraging because on the issues…for example I will give you a couple tid bits... 2 to 1 Hispanics in Texas that just voted identified themselves as more conservative than liberal...and on most the issues that the Republican Party stands for, the data shows that we’re doing very well…that the disconnect was that despite that, the majority of Hispanics still voted for the Democratic party. So we have the Hispanic community in tune with the party in terms of most of their principles and yet we’re losing the Hispanic vote. So to me, it means we have our work cut out for us on education to get rid of that disconnect, and part of having the ability to educate is you have to be in those communities and some other groups are sharing with professional focus groups so we’re taking all of this data and figuring out the best approach for the participating community, but to me the key is the national party has to make a commitment because they had over 400 employees during the election and several hundred million to spend, and as far I know, there wasn’t a single person inside of Texas to work on outreach and we have to change that. We have to get the national party to understand that you can’t win national elections if you don’t win Texas, and we won’t be able to win Texas unless we get a very high percentage of the Hispanic vote. Adryana Boyne: Well I appreciate so much that comment because I whole heartily agree with you. The Republican National Committee actually sent me an email last night about a conference call this morning. An hour conference call, of course I could not be present at the conference call because I was here at the Capitol, but hopefully this is a response about the work that you have done with them and I wish you the best if you meet with with them, and I look forward to keeping up with you and thank you for your service with the Republican Party of Texas. Steve Munisteri: We’re going to keep hammering because they need to be serious about outreach, and they have a whole lot more money than we do.